An elderly lady named Nancy Cowen adopted a stray cat which she named Cleo. 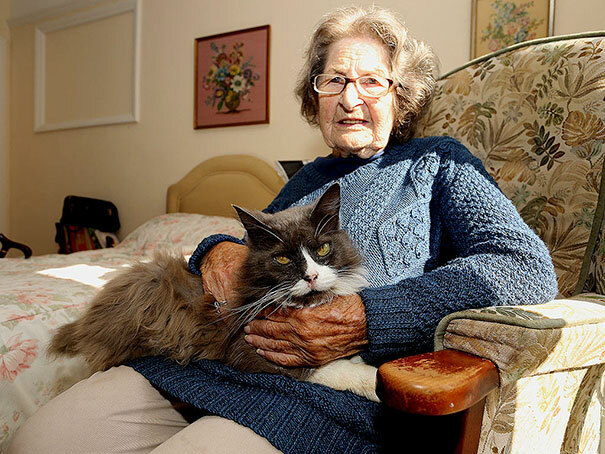 Sadly, the two had to part 8 years later when Nancy went to live at Bramley House care home in the village of Westcott, Sussex, UK and Cleo moved in with a neighbour. 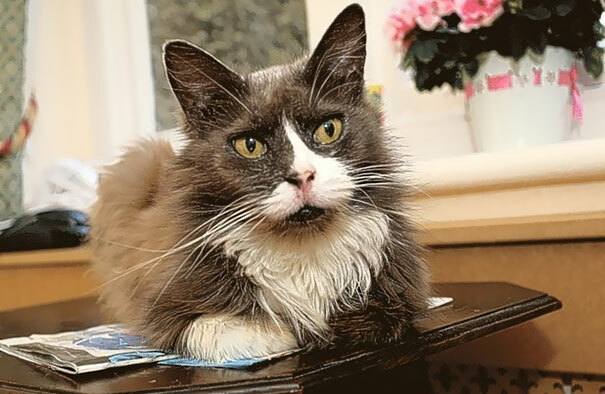 But it seems the loyal feline had other ideas because a few weeks later a friendly cat started wandering around the care home, peering through the windows and sleeping in the benches at front of the home. The true identity of the care home’s newest resident did not become clear for another two weeks, although staff took a liking to their friendly guest. “One of the other carers picked her up one day and Nancy said, ‘That cat looks like my cat’,” said Costello. “Then she said her cat had lost part of her tail in a traffic accident.” The workers then checked the cat’s tail and it was missing most of it. That’s when they realised that this was Nancy’s cat Cleo. “I don’t know how Cleo found her,” Costello said. “There’s no way she could have followed her, since it’s quite a way from where Nancy used to live before she came here.” Luckily, the nursing home let Nancy keep her faithful cat, so the two could spend their golden years together. “We were all absolutely delighted. We all thought it was wonderful,” said caregiver Leslie Thomas. A lot of people say that only dogs are loyal pets but there are many cats that can prove this statement to be wrong!